Tremendous advancements have been made in understanding the processes of wound healing. The cell types and the order in which they appear in the wound have been established; many growth factors and their functions have been elucidated. Despite the advances in understanding the science of wound healing, many more steps have yet to be discovered and elucidated. The frontier of this field includes the prevention of hypertrophic and keloid scar formation and, ultimately, any visual remnant of the wound. An incision created by a scalpel, trauma resulting from a bullet, or tissue death caused by a myocardial infarction all undergo a similar and predictable reparative process. Understanding how the body repairs damaged tissue and what factors influence the wound healing process helps the surgeon ensure an acceptable outcome from surgery. Tissue injury is common thread to every medical specialty. Wound healing in any tissue follows a predictable sequence of events. A broad understanding of the sequence of events, cells involved, relative time table, and molecular signaling can allow for maximum optimization of this important patient care issue. The 3 categories of wound closure are primary, secondary, and tertiary. Primary healing involves closure of a wound within hours of its creation. Secondary healing involves no formal wound closure; the wound closes spontaneously by contraction and reepithelialization. Tertiary wound closure, also known as delayed primary closure, involves initial debridement of the wound for an extended period and then formal closure with suturing or by another mechanism. Knowledge of the phases of wound healing allows the practitioner to counsel patients effectively and treat wounds appropriately. The typical wound, after primary closure, may take over a year to fully mature; the appearance of the scar may dramatically change during this time. Thus, all wounds should be at least 1 year old before scar revision is considered. The wound healing process has 3 phases. They are the inflammatory phase, the proliferative phase, and the remodeling phase. The inflammatory phase is characterized by hemostasis and inflammation. Collagen exposed during wound formation activates the clotting cascade (both the intrinsic and extrinsic pathways), initiating the inflammatory phase. After injury to tissue occurs, the cell membranes, damaged from the wound formation, release thromboxane A2 and prostaglandin 2-alpha, potent vasoconstrictors. This initial response helps to limit hemorrhage. After a short period, capillary vasodilatation occurs secondary to local histamine release, and the cells of inflammation are able to migrate to the wound bed. The timeline for cell migration in a normal wound healing process is predictable. See the image below. Wound healing and growth factors. 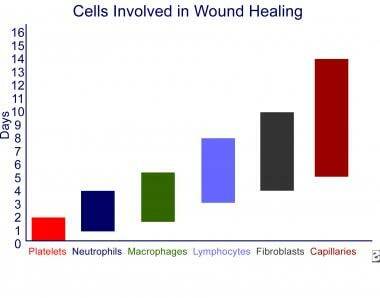 Cells involved in wound healing. The cells appearing in a wound are depicted in sequence from left to right, and the color bars represent the range of days each cell type is in the wound. The inflammatory phase begins at the time of injury and lasts 2-4 days. The phase begins with hemostasis and formation of the platelet plug. Platelets release platelet-derived growth factor (PDGF) and transforming growth factor beta (TGF-b) from their alpha granules to attract neutrophils and macrophages. Neutrophils scavenge for bacteria and foreign debris. Macrophages are the most important mediators of wound healing. Macrophages continue to emit growth factors to attract fibroblasts and usher in the next phase of wound healing (see Table below). The proliferative phase begins on approximately day 3; it overlaps with the inflammatory phase. The most important cell is the fibroblast. Fibroblasts peak approximately day 7 from injury and are responsible for initiating angiogenesis, epithelialization, and collagen formation. Epithelialization is from the basement membrane if the basement membrane remains intact (eg, first-degree burn). If the basement membrane is not intact, the epithelialization is from the wound edges. Fibroblasts produce mainly type III collagen during this phase. Granulation tissue, formed in this phase, is particularly important in wounds healing by secondary intention. When collagen synthesis and breakdown become equal, the next phase of wound healing has begun. Increased collagen production and breakdown continue for 6 months to 1 year after injury. The initial type III collagen is replaced by type I collagen until a type I:type III ratio of 4:1 is reached, which is equal to normal skin. Also, fibroblasts differentiate into myofibroblasts, causing tissue contraction during this phase of wound healing. Collagen reorganizes along lines of tension and crosslinks, giving added strength. Strength eventually approaches 80% of the strength of uninjured tissue. Vascularity decreases, producing a less hyperemic and more cosmetically appealing wound as this phase progresses. The timetable for wound healing can be quite variable. Chronic wounds can stall in the inflammatory phase because of poor perfusion, poor nutrition, or a myriad of other factors causing excessive buildup of exudates in the wound base. These wounds tend to remain unhealed unless active and aggressive means are undertaken to correct the underlying comorbidities while providing proper wound care. Healing may also become exaggerated in keloid and hypertrophic scar formation. Excessive type III collagen formation in the proliferative phase causes an overgrowth of scar tissue in these wounds. The etiology is multidimensional. Individuals with darkly pigmented skin are genetically prone to keloid formation. Certain areas of the body, such as the sternum and shoulder, are more prone to hypertrophic scar formation. Growth factors represent the intercellular signaling that orchestrates the complex sequence of cell migration, division, differentiation, and protein expression during wound healing. The 8 major families of growth factors are expressed in varying levels by the cells involved with healing. Stimulates fibroblasts to secrete collagenase to degrade the matrix during the remodeling phase. Stimulates keratinocyte and fibroblast proliferation. May reduce healing time when applied topically. TGF-b1 and TGF-b2: Promotes angiogenesis, up-regulates collagen production and inhibits degradation, promotes chemoattraction of inflammatory cells. TGF-b3 (antagonist to TGF-b1 and b2): Has been found in high levels in fetal scarless wound healing and has promoted scarless healing in adults experimentally when TGF-b1 and TGF-b2 are suppressed. Promotes angiogenesis during tissue hypoxia. Promotes angiogenesis, granulation, and epithelialization via endothelial cell, fibroblast, and keratinocyte migration, respectively. Attracts macrophages and fibroblasts to zone of injury. Promotes collagen and proteoglycan synthesis. IL-4: Activates fibroblast differentiation. Induces collagen and proteoglycan synthesis. IL-8: Chemotactic for neutrophils and fibroblasts. Granulocyte colony stimulating factor (G-CSF): Stimulates granulocyte proliferation. Stimulates keratinocyte migration, differentiation, and proliferation. Creating conditions that allow for proper wound healing can make all the difference in various wounds, from an inconspicuous wound after plastic surgery to an amputation or even death in a patient with severe vascular disease or burn. When approaching an injured patient, the following list can guide the thought process of the physician or caretaker in optimizing healing conditions. Perfusion: Tissues cannot heal without the cells, oxygen, and nutrients that the cardiovascular system delivers. This is particularly important in the wound healing of patients with diabetes or paraplegia, patients who smoke, and patients who have been exposed to radiation. Patients with severe vascular disease may experience enhanced wound healing via increased perfusion after a vascular bypass or related procedure. Patients who smoke should cease smoking immediately in the event of major surgery or injury. Nicotine causes severe vasoconstriction, and the toxins in cigarette smoke can greatly decrease the ability of tissues to heal. Paraplegics and diabetics with neuropathy must cease all substance abuse and be continually educated and reinforced on the need for pressure relief to avoid pressure ulcers. In the event of pressure sore discovery, absolute pressure relief to increase perfusion is paramount. Infection: Infection is defined as having quantitative bacterial counts of 105 colony forming units per gram of tissue. Infected wounds do not heal because of decreased epithelialization and increased collagen breakdown. These wounds should be appropriately cleared of infection by drainage, debridement, and the administration of appropriate antibiotics. Nutrition:  When assessing nutritional status, certain serum nutritional markers can be helpful. Albumin is a good marker of overall long-term nutritional status over the last month; ideally, it should be at least 3.5 g/dL to optimize wound healing. Prealbumin can offer a more recent nutritional status picture and should be maintained above 17 g/dL. Caloric needs of the severely injured patient can exceed 35 kcal/kg/d and 0.8-2 g/kg/d of protein and should be continually assessed and adjusted according to the stage of healing and injury. This is particularly true for burn patients who require multiple debridements and grafting. Vitamin supplementation has not been proven to increase wound healing unless a specific deficiency exists. Vitamin A is an exception to this rule and is detailed below. Steroids: Corticosteroids can blunt the response of macrophages, the most essential cell in wound healing. Vitamin A, insulinlike growth factor (IGF), and oxandrolone (anabolic steroid) can be given to reverse the effects of corticosteroids on wound healing. Dressing: Numerous dressings are available on the market. Many claim that they need to be changed less often than other dressings. This may be true for a clean wound. However, there is no substitute for frequent dressing changes in a grossly contaminated or recently debrided infected wound. Other basic principles apply. The wound should be kept moist (but not wet) at all times. Desiccated tissue is dead tissue and must be sharply debrided. With the advent of negative pressure wound dressing, wound healing for even chronic wounds can be greatly increased. Again, great prudence should be used; apply negative pressure wound dressing only when indicated. Proper wound healing involves a complex interaction of cells and cytokines working in concert. In recent years, more chemical mediators integral to this process have been identified. The sequential steps and specific processes have not been fully differentiated. When examining the process of wound healing, one should identify the major steps and know the important mediators. Primary closure: A wound closed surgically with sutures or by other means soon after creation is considered a primary closure. Secondary closure: This type of closure is appropriate for infected or contaminated wounds in areas of poor blood supply. The wound fills with granulation tissue, contracts, and reepithelializes. This leads to a worse scar from a prolonged inflammatory phase. Tertiary closure (delayed primary closure): This type of closure allows for a superior cosmetic appearance to the closure of a contaminated wound. The wound is allowed to stay open and undergo repeat dressing changes for a few days. This decreases the bioburden of the wound and allows for a decreased infection rate after surgical closure a few days later. Acute wound: A wound is acute if it occurred in the last 4-6 weeks. Chronic wound: A wound is chronic if it has been present for longer than 4-6 weeks. Ueno C, Hunt TK, Hopf HW. Using physiology to improve surgical wound outcomes. Plast Reconstr Surg. 2006 Jun. 117(7 Suppl):59S-71S. [Medline]. Tamari M, Nishino Y, Yamamoto N, Ueda M. Acceleration of wound healing with stem cell-derived growth factors. Int J Oral Maxillofac Implants. 2013 Nov-Dec. 28(6):e369-75. [Medline]. Komarcevic A. [The modern approach to wound treatment]. Med Pregl. 2000 Jul-Aug. 53(7-8):363-8. [Medline]. Ferguson MW, O'Kane S. Scar-free healing: from embryonic mechanisms to adult therapeutic intervention. Philos Trans R Soc Lond B Biol Sci. 2004 May 29. 359(1445):839-50. [Medline]. Zarei F, Soleimaninejad M. Role of growth factors and biomaterials in wound healing. Artif Cells Nanomed Biotechnol. 2018 Feb 15. 1-6. [Medline]. Khan S, Villalobos MA, Choron RL, Chang S, Brown SA, Carpenter JP, et al. Fibroblast growth factor and vascular endothelial growth factor play a critical role in endotheliogenesis from human adipose-derived stem cells. J Vasc Surg. 2017 May. 65 (5):1483-1492. [Medline]. Yan D, Liu S, Zhao X, Bian H, Yao X, Xing J, et al. Recombinant human granulocyte macrophage colony stimulating factor in deep second-degree burn wound healing. Medicine (Baltimore). 2017 Jun. 96 (22):e6881. [Medline]. [Full Text]. Jonsson K, Jensen JA, Goodson WH 3rd, et al. Tissue oxygenation, anemia, and perfusion in relation to wound healing in surgical patients. Ann Surg. 1991 Nov. 214(5):605-13. [Medline]. Langemo D, Anderson J, Hanson D, Hunter S, Thompson P, Posthauer ME. Nutritional considerations in wound care. Adv Skin Wound Care. 2006 Jul-Aug. 19(6):297-8, 300, 303. [Medline]. Thomas DR. Specific nutritional factors in wound healing. Adv Wound Care. 1997 Jul-Aug. 10(4):40-3. [Medline]. Koveker GB. Growth factors in clinical practice. Int J Clin Pract. 2000 Nov. 54(9):590-3. [Medline]. Jiang L, Dai Y, Cui F, Pan Y, Zhang H, Xiao J, et al. Expression of cytokines, growth factors and apoptosis-related signal molecules in chronic pressure ulcer wounds healing. Spinal Cord. 2013 Dec 3. [Medline]. Bone RC, Dantzker DR, George RB, et al, eds. Pulmonary and Critical Care Medicine. St. Louis, Mo: Mosby-Year Book; 1998. Brown DL, Borschel GH, et al, eds. Michigan Manual of Plastic Surgery. Philadelphia, Pa: Lippincott Williams & Wilkins; 2004. Cohen IK, Diegelmann RF, Lindblad WJ, eds. Wound Healing: Biochemical and Clinical Aspects. Philadelphia, Pa: WB Saunders; 1992. Cohen K, Diegelmann RF, Yager DR, et al. Wound Care and Wound Healing. Schwartz SI, Shires GT, Spencer FC, Daly JM, Fischer JE, Galloway AC, eds. Principles of Surgery. 7th ed. New York, NY: McGraw-Hill; 1999. 263-96. Folkman J, Shing Y. Angiogenesis. J Biol Chem. 1992 Jun 5. 267(16):10931-4. [Medline]. Howarth G, Ferguson MWJ. Marsupial models of fetal wound healing. Adzick NS, Longaker MT, eds. Fetal Wound Healing. New York, NY: Chapman and Hall; 1992. 95. Lu L, Saulis AS, Liu WR, Roy NK, Chao JD, Ledbetter S, et al. The temporal effects of anti-TGF-beta1, 2, and 3 monoclonal antibody on wound healing and hypertrophic scar formation. J Am Coll Surg. 2005 Sep. 201(3):391-7. [Medline]. Sabiston DC, Townsend CM, Beauchamp DR, et al. Sabiston Textbook of Surgery: The Biological Basis of Modern Surgical Practice. 16th ed. Philadelphia, Pa: WB Saunders; 2001. Thorne CH, et al. Grabb and Smith's Plastic Surgery. 6th ed. Philadelphia, Pa: Lippincott Williams & Wilkins; 2007.